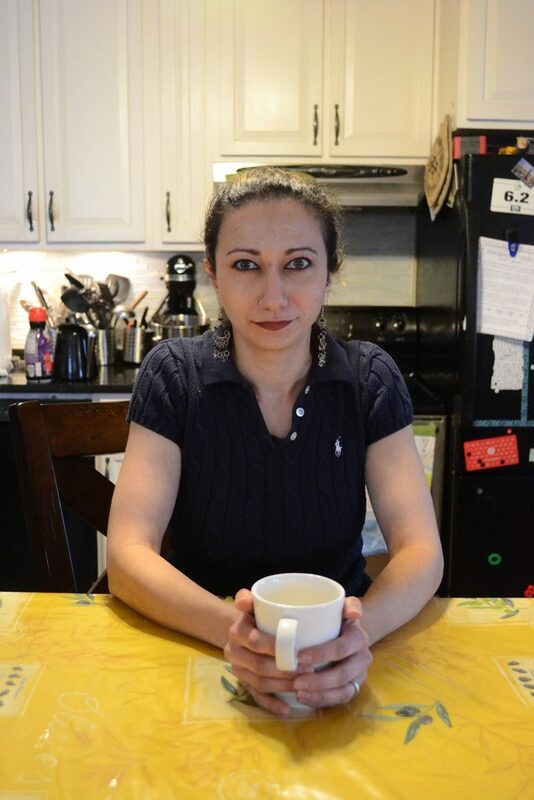 Karima Rizk in her home in Easthampton. Coffee made with beans roasted with CBD. Last week I sat down with Karima Rizk for a cup of coffee in her kitchen in Easthampton to discuss her new business, Cafe Vert. 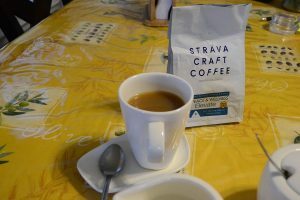 The coffee was like many other homebrewed cups of coffee: it was rich, balanced, and welcoming on the brisk December morning. But unlike most cups of coffee, the coffee beans that Rizk used were roasted with CBD (a cannabinoid found in hemp and cannabis). Drinking CBD coffee wasn’t that different than drinking normal coffee. It didn’t taste or smell different and it didn’t make me feel any different than a normal cup of coffee would (CBD is considered a non-psychoactive cannabinoid that is said to have many medicinal qualities). CBD coffee is just one example of the types of products that Rizk might be able to serve at her potential cannabis cafe. Rizk is an entrepreneur who plans to open a regular cafe, Cafe Vert, in Easthampton in late spring or early summer of 2018. Her hope is that she will be able to apply for a license in the future to be a mixed-use business where customers can consume marijuana in a social coffeehouse environment. Massachusetts is one of nine states that have legalized the use of recreational and medical marijuana. While some states, like Colorado, have had legal recreational cannabis laws for years now, one aspect of recreational use that has proved a challenge for legislators to write law for is consuming in public. On December 14 the Cannabis Control Commission (CCC) in Massachusetts concluded its public deliberations on policy matters regarding the implementation of the recreational adult-use cannabis industry in Massachusetts. The decisions made last week will be included in the first draft of regulations (to be filed on Dec 29), to prepare for the March 15 statutory deadline. Included in these policy recommendations is the decision to permit social consumption, but to prohibit smoking in any social use establishment. Marty Klein is a resident of Easthampton who said that he supports the idea of businesses like Cafe Vert because of his belief that cannabis is less harmful than alcohol. A report published by Scientific Reports in 2015 confirmed this. The report found that when compared to nine other drugs, including alcohol and tobacco, marijuana was by far the least dangerous. Klein hopes to use the cafe to mingle with new people and friends. “Just the same way a bar or a restaurant is utilized,” Klein said. As someone who voted for the recreational marijuana law in 2016, I’m excited at the prospect of bar and coffeehouse spaces for cannabis. Those spaces are already a big part of my community. They are where I support local businesses, attend fundraisers, and meet friends, why wouldn’t I support another similar craft industry? Based on recent CCC meetings, statewide social consumption guidelines are shaping up to be some of the first in the country to allow the on-site sale of single-use marijuana at a variety of establishments, including cafes, yoga studios, and restaurants. Basically, imagine if marijuana was as normalized as alcohol. Business owners like Rizk could apply for mixed-use licenses to serve single-use cannabis products at their businesses, from places like Cafe Vert to movie theaters to restaurants. If the CCC passes social consumption regulations in 2018, Rizk’s cafe in Easthampton could be one of the first of its kind in the country. I believe that all local municipalities should be discussing what the social consumption of cannabis looks like in their town or city so they are prepared to take advantage of this economic opportunity in a safe way. Easthampton City Councilor Salem Derby, who is chairman of the Ordinance Committee, agrees. “If we aren’t forward thinking in trying to figure out a place where people can responsibly consume, then we’re kind of forcing people out into the open to smoke on the bike path or in their cars,” Derby said. Illegal and unregulated public consumption can be safety concerns and may be also bad for business. Massachusetts and Maine are the only places where recreational marijuana is legalized in the northeast, so the opportunity to have a strong cannabis tourism economy is huge. Without legalizing and regulating social consumption, people who visit from out of town for legal recreational marijuana have nowhere to use it. Imagine if the amazing craft beer that we have in Western Mass couldn’t be consumed in public. Would people still travel from somewhere like New York City to do a beer tour? Rizk also said that there should be an option for people who live in public housing, renters, veterans, and parents who don’t want to consume at home or don’t have a home to consume in. “The argument that you can just go home and smoke in your house really is one of privilege,” Rizk said. The Easthampton Planning Board finished several months worth of cannabis zoning discussions on Dec. 5. Next, the City Council Ordinance Subcommittee will host public debates until eventually another draft will be passed on the the full City Council for further discussion and debate. Part of the trouble for cities and towns like Easthampton who want to get a jump on setting their own regulations is that they are left in the dark until the CCC finalizes its statewide standards. Despite the fact that almost everything about social consumption in Massachusetts and Easthampton is subject to change in the next few months, Rizk is still moving forward with opening a non-cannabis brick-and-mortar cafe in spring or summer 2018. Cafe Vert is not going to be your average coffee shop. Rizk wants run a model business for clean, craft cannabis. From sourcing ingredients locally (hopefully even cannabis), to being energy efficient, to providing educational materials and presentations for consumers and the public, Rizk plans on building not just a cafe but an institution that will represent a new vision for cannabis consumption in Massachusetts. Meg Bantle can be reached at mbantle@valleyadovcate.com.